If you are looking for information on the Jack in the Box franchise business opportunity, Jack in the Box franchises or Jack in the Box franchising, then you have come to the right place. Jack in the Box Inc. is now offering a unique opportunity to partner with one of the most popular brands in the quick-serve restaurant industry. We're looking for franchise candidates that have the financial and operational wherewithal to develop multiple Jack in the Box® restaurant locations. Yes, this is your chance-in-a-lifetime to operate your very own Jack in the Box restaurant. 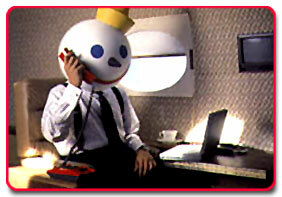 Unlike our major QSR competitors, most Jack in the Box restaurants are company-operated. Our long-term goals are to grow the percentage of franchise ownership in the Jack in the Box brand by approximately 5 percent annually and to move toward a range of franchise ownership more closely aligned with that of QSR industry. To achieve these goals, we are selling many existing company restaurants to franchisees and selling development agreements for new restaurants in new markets. Interested in ditching your tie or stuffy power suit for a lei and mai tai? Or maybe a cool, yellow hat? Then this may just be the opportunity for you. Jack in the Box Inc., founded in 1951, is a restaurant company that operates and franchises Jack in the Box® restaurants and, through a wholly owned subsidiary, Qdoba Mexican Grill® in a combined 43 states. The company also operates more than 60 proprietary convenience stores called Quick Stuff®, which include a major-branded fuel station and are developed adjacent to a full-size Jack in the Box restaurant. Jack in the Box is among the nation's leading fast-food hamburger chains, with more than 2,100 quick-serve restaurants in 18 states. As the first major hamburger chain to develop and expand the concept of drive-thru dining, Jack in the Box has always emphasized on-the-go convenience, with approximately 85 percent of the half-billion guests served annually buying food at the drive-thru or for take-out. In addition to drive-thru windows, most restaurants have indoor dining areas and are open 18-24 hours a day. Based on site specific information provided by the franchisee, our Architecture and Engineering department can prepare a schematic site plan indicating the placement of a proposed prototype facility on the site as well as identify parking areas, landscaped areas and access to adjoining streets or properties. In addition, the department can provide standard prototypical building plans and specifications reflecting the requirements for design, decoration, furnishings, layout, equipment, fixtures and signs for Jack in the Box® restaurants. These plans may be modified by the franchisee's local architect as required to accommodate all applicable codes and site specific requirements. The department will also be available to provide assistance in addressing technical facility questions that may arise. The aforementioned services are provided at no cost to the franchisee. Additional services may be obtained on an hourly basis, subject to the department's work load and availability. 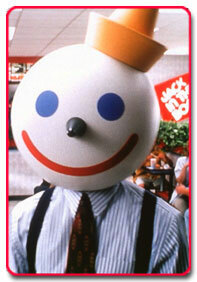 Jack in the Box has one of the most sophisticated training systems in the quick-service industry. Our blended training approach spans 10 weeks, and incorporates classroom content, computer-based learning and applied in-restaurant developmental activities. These resources are available throughout the entire restaurant lifecycle, from initial restaurant opening through ongoing management development. We believe this balanced approach, which is closely aligned with our business model, emphasizes the integral relationship between staff, guests and restaurant profitability. 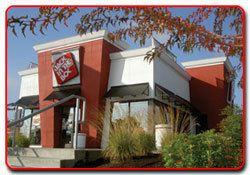 Jack in the Box uses the latest touch-screen POS technology in our front-of-house POS systems. Our back-of-house management information system includes a suite of applications that help the restaurant's operations. Each restaurant is connected to a satellite communications network that is used to send and receive information to and from each restaurant. Full help-desk support is available for all in-restaurant technology. Our team of marketing professionals will provide every franchisee with the high level of service and support to facilitate innovative new product introductions, sales-building consumer promotions, compelling advertising and effective media planning, dynamic local marketing and exciting merchandising materials. Our on-going support includes strategic brand planning, competitive analysis, new product testing and menu optimization, driven by consumer-based research as needed. Our Regional Franchise Directors (RFDs) will provide high quality support in compliance with system standards. We take an aggressive role in stimulating sales to achieve greater franchise and company profitability. The RFDs will conduct meetings when appropriate, regular field operation visits, restaurant facility audits, training for system changes and rollouts for new programs and products. Our world-class Purchasing group partners with suppliers to provide low prices, strong R&D support, reliable supply and food and plant safety guidelines. Our goal is to provide each company-operated and franchised restaurant we serve with a sustainable, reliable supply network that provides the most cost-effective sourcing in the industry. Our unique and integrated distribution system, from our distribution centers to our trucks, is operated exclusively by Jack in the Box employees as a strategic asset to our brand. Our Finance group reviews most of the major franchise lending sources in the industry. They will provide a list of third party finance companies that work with Jack in the Box franchisees, from equipment leasing to new restaurant development.